Spring is in the air and all things are in bloom! This is one of our most favorite times of the year and there is no better time to refresh and renew yourself! Whether it is achieving optimal health, losing weight, or erasing the signs of aging, our team is here to help you achieve your goals! Woodlands Wellness website and Newsletter have a NEW look and we are so excited to share it with you! If you haven't seen our website yet click the link below and check it out! April showers bring spectacular savings! Refresh and renew yourself with this months specials there is something for everyone! Sanavi (sa-na-vi) is Latin for healing. Based on advanced science using phyto stem cells, active plant enzymes, powerful peptides and nourishing moisturizers, Sanavi isn't just nurturing, its nourishing. Made with vitamins, minerals, and skin healing nutrients, Sanavi is your skin's healing protocol! A natural yet effective approach to skin care & health developed by Dr. Sakina Davis, a leading expert in health & wellness. 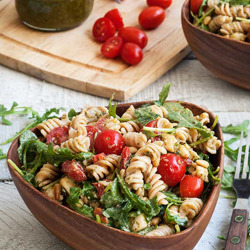 Gluten Free Summer Pasta Salad Recipe Click here to get the recipe! Moms need pampering too so why not get her the gift to relax this Mother's Day with a GIFT CARD from Woodlands Wellness! Stop by to purchase one today and we will suprise you with a gift with purchase. May 5th form 1-6pm come and go as you please. Hot specials you won't want to miss!